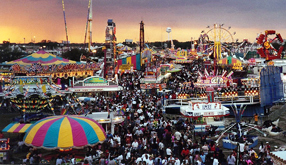 Get the latest on what's happening around the fair industry. We bring you up-to-date headlines from news sites around the web, plus Fair News and Associates in the News coverage from Fairs & Expos magazine. Now you can read what's going on in the industry before Fairs & Expos is released. Want even more news? Be sure to become an IAFE member and receive a bi-monthly e-newsletter with all the latest stories and trends in the fair industry.